Motorbike stolen; answers to “Thumper” | Do You Sociate? On April Fool’s Day, I noticed the disappearance of my beloved bike, a 1989 Honda GB500 TT (Tourist Trophy) that I’d bought used in 1998. I had seen it the night before, parked as usual parallel to the curb outside our flat on Church Street (in San Francisco). Maybe, I thought, it’s an April Fools prank. But a couple of days went by and Thumper didn’t rematerialize. 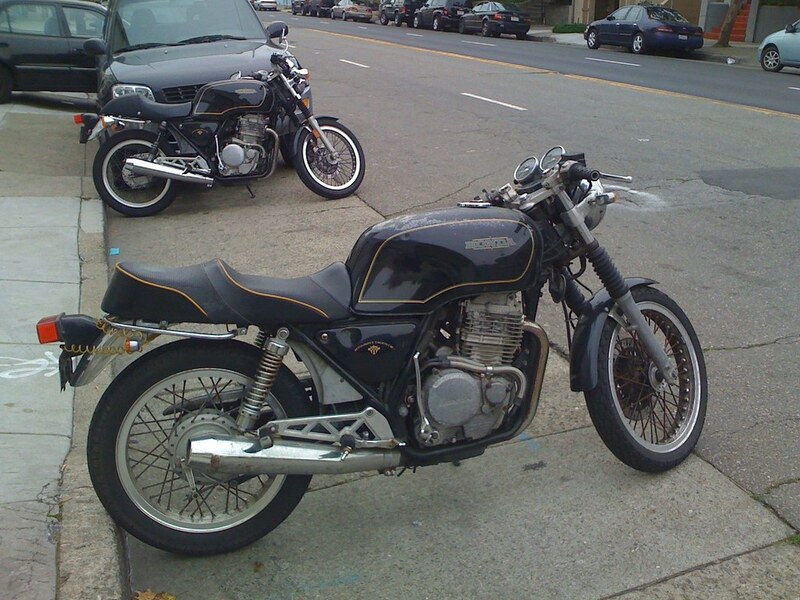 Assuming bike thieves don’t read too many blogs, I’ll point out Thumper’s real distinguishing mark: the seat isn’t the stock GB500 seat (which you see in the nicer bike in the background), but rather an aftermarket seat with yellow piping I had just bought and installed. For confirmation, the last numbers of Thumper’s license are 341. If you sight him, please drop me a line. By the way, single-cylinder, four-stroke bikes are called “thumpers” because they have a bit more vibration than multi-cylinder bikes. But I liked the image of the rabbit.